An county of gently rolling arable land, know since Roman times for its rich farming and forestry. Over ninety percent of Gloucestershire is countryside, over half of which is designated as an area of Outstanding Natural Beauty (ONB). The county is dominated in the East by a band of limestone hills known as the Cotswolds and to the west by the ancient Royal Forest of Dean. The Cotswolds hills rise to over 1,000 feet at Cleever Hill, a place that is wonderfully scenic and quintessentially English. 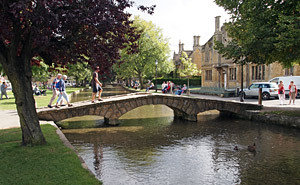 The lush countryside and picture-postcard villages makes this area of Gloucestershire a highly popular tourist destination. The River Severn runs through Gloucestershire from north to south. The Severn Valley is about 8 miles wide in the north and known locally as the Vale of Gloucester. To the south of Gloucester it narrows to become the Vale of Berkeley. Britain's Severn Bore (a large surge wave that travels inland along the estuary of the River Severn) is a spectacular natural phenomena and is one of the largest in the world. The Severn estuary is shaped such that the incoming tidal waters are funneled into an increasingly narrow channel, as the tide rises. This forms a large wave that can travel all the way up the river to Gloucester. For details of Bore times and the best viewing points visit the Environment Agency web site. Double Gloucester - a soft mellow cheese made with full cream milk. Gloucestershire Squab Pie - lamb and apples topped with a swede and potato mash. First recorded in 1016 as Gleaucestrescir, meaning bright place or shining fortress. Taken from the Brittonic 'Glouiu'. Its Roman name was Glevum.